"Unlike some entry-level models, this model from Ryobi features a brushless motor for less resistance and greater durability." "The rapid charger can have a dead battery ready to go in about 30 minutes — so you won’t have to wait long if you do need to recharge in the middle of the job." "It’s so easy to push that some people skip using the self-propelling mechanism altogether (which does help to prolong battery life even more)." "Pairs a 30-minute rapid recharge with quality components and an affordable price tag." "Quickly earns its place in the garage thanks to convenience, savings, and efficiency." "Arrives preprogrammed and with the AIA technology needed to navigate narrow areas or to maneuver around obstacles." "A great choice if you have a smaller yard or want the perks of a battery lawn mower without spending big bucks." "This multi-tasking tool allows you to seamlessly switch between mowing, edging, and trimming for a tidy yard in no time." This highly-rated model from one of the leading power tool manufacturers offers easy operation and quality components and is recommended by almost everyone that buys it. Unlike some entry-level models, this model from Ryobi features a brushless motor for less resistance and greater durability. And while it isn’t self-propelled, people report that it’s easy to maneuver and operate—even for pre-teens with adult supervision. You can adjust the cutting height to one of seven settings with a single lever. And while this mower can mulch or bag clippings, you will need to purchase a separate accessory if you want to side discharge them. The 40V high-capacity 5Ah lithium-ion battery offers up to 40 minutes of run time before you’ll have to commit to a 3.5-hour charge. 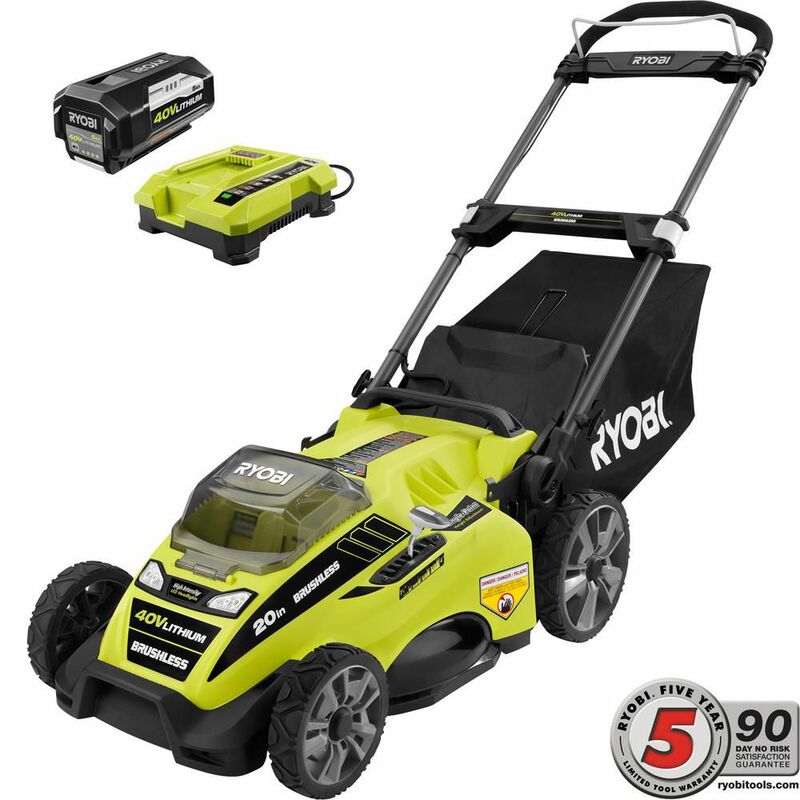 This is enough time to mow your average suburban lawn, but owners of this Ryobi battery lawn mower report being able to mow up to ½ an acre with good results. If you do run out of juice, it's nice to know that the batteries are interchangeable with other Ryobi power tools. Available for a few hundred dollars, the Ryobi 20-inch 40V Battery Lawn Mower won’t break the bank or nickel and dime you with the cost of fuel, oil, and spark plugs! This battery lawn mower is our top choice if you want the convenience of an electric mower without the hassle of a cord. This self-propelled battery lawn mower pairs a 21-inch mowing deck with a variable speed transmission and handy features like push-button start and load sensing technology that regulates power. It’s surprisingly quiet according to users and runs smoothly. The speed at which the mower self-propels can be controlled via a lever placed within arm’s reach on the handle. Just know that you’ll have to release the self-propel handle to mow backwards—but this is a safety measure common on many self-propelled mowers. You’ll enjoy the convenience of seven different cutting heights, all controlled by a single lever. And like many other full-featured battery lawn mowers, this one comes equipped with the ability to mulch, bag, or discharge clippings. The Snapper XD comes with two 2Ah batteries and a rapid charger. Each battery is rated for 45 minutes of use, so you’ll have about 90 minutes of mowing time in total. People report that the rapid charger can have a dead battery ready to go in about 30 minutes—so you won’t have to wait long if you do need to recharge in the middle of the job. The mower has a folding handle and stores vertically, making good use of your storage space. With a solid metal decking, rugged wheels, efficient self-propelling abilities, and two batteries, this mower is a worthwhile investment that will make it easier to justify the high price tag. If you have a big backyard and want a battery mower that is equal to the task of manicuring your lawn, go for the robust EGO 21-inch Cordless Mower. Offering one of the biggest batteries on the market, this mower can outlast many other cordless mowers and is equipped with a 3-in-1 function for clippings including mulching, bagging, or discharge options. This model from EGO is equipped with a whopping 7.5Ah 56-volt lithium-ion battery that is rated for a run time of 60 minutes when fully charged. It offers a rapid recharge time of 60 minutes to match. You’ll need to treat this mega battery with a little care to make sure it maintains such peak performance; the manufacturer recommends storing the battery in a climate-controlled environment. When it comes to operating this battery lawn mower for large yards, people praise the machine for its maneuverability and light weight. This is likely because much of the housing is made from polymer panels instead of metal, but despite that most say that the overall feel is one of a well-engineered and well-made machine. It also is a self-propelled mower, but it’s so easy to push that some people skip using the self-propelling mechanism altogether (which does help to prolong battery life even more). With more than 4,000 reviews, there’s a lot to love about the EGO 21-Inch Cordless Mower and it’s a great choice if you have a large yard or want superior battery life. Skip long recharge hours and yardwork delays by investing in a battery lawn mower with quick charging batteries. The Kobalt 21-inch Cordless Electric Mower pairs a 30-minute rapid recharge with quality components and an affordable price tag. The Kobalt Cordless Electric Lawn Mower is recommended by nearly 90 percent of purchasers and is powered by a 2Ah lithium-ion battery with 80-volts. Included is an additional 2Ah battery and a quick charger that will have you up and running in just 30 minutes. Like most other quality electric lawn mowers, this model features a brushless motor for durability. This mower is recommended for lawns up to an acre in size. People like it for its rugged steel deck, quick charging times, and efficient cutting power. As you may expect, it also includes the ability to bag, mulch, or discharge grass clippings. It also has seven different cut positions to choose from, all adjusted by a single lever. The mower is covered by a 5-year warranty, and the batteries are covered for 3 years. It should also be noted that the batteries are interchangeable with all Kobalt power tools that share the 80-volt lithium-ion platform. If you like your riding lawn mower but want the convenience and easy-keeping of a battery version, you’ll love the Ryobi 38-inch Electric Riding Lawn Mower. This battery-powered model is to the lawn mower world what electric cars are to the automotive industry—a novel concept that quickly earns its place in the garage thanks to convenience, savings, and efficiency. Looking like a cross between a traditional riding mower and an electric golf cart, the Ryobi turns heads while it makes quick work of cutting up to 2.5 acres of grass on a single charge of the 100Ah lead acid battery. Three brushless motors power a pair of blades for even, consistent results and the deck has 12 manual height adjustments—anywhere from 1.5 to 4.5 inches. In addition, this mower is equipped with cruise control. People rave about this battery riding lawn mower from Ryobi. They love it for its zero emissions and low maintenance (no gas, oil, or spark plugs). Some owners have even gone so far as to ride it several blocks to the store as if it’s a go-cart. Don’t expect the ride to be particularly cushy, though. A few people point out the seat can be a bit bumpy and there are no armrests. The turning radius is on par with other riding lawn mowers, but the noise level is dramatically reduced at only 70 decibels. Of course, riding lawn mowers aren’t cheap, and this electric version from Ryobi pushes past the $2,500 mark. However, people agree that it’s money well-spent and worth its lifetime savings in gas and maintenance. Wish you could watch your lawn be mowed from the comfort of your couch or know that the job will be done when you get home from work? Make it so with a robotic lawn mower like the Worx Landroid. This battery-powered lawn mower is equipped with the technology to zip around up to ¼ acre of property mowing down grass before heading back to its base to recharge or escape the rain. The Landroid arrives pre programmed and with the AIA technology needed to navigate narrow areas or to maneuver around obstacles. If it does reach an impasse, it is equipped with an audible beep that lets you know it needs rescuing. While most people love their Landroid so much that it earns its own nickname and becomes a robotic lawn pet of sorts, you should take note of the fact that set-up can be extensive and must be done right for this robotic lawn mower to function properly. A perimeter wire (included with purchase) must be installed that will allow the Landroid to maintain its bearings and function properly. Some people report having to adjust the perimeter wire and therefore recommend that you don’t bury it until you’ve let the Landroid loose a few times. While this type of battery lawn mower has a few quirks and costs a bundle—nearly $1,000—people love the convenience and freedom of having a robotic mower. Improvements to the technology powering Landroid have further enhanced the ownership experience. Robotic lawn mowers are already popular in Europe, and this technology is on the rise in the United States as well. Get ahead of the curve and your weekend to-do list by putting the Worx Landroid Robotic Lawn Mower to work for you. At this price, you will have a mowing machine that doesn’t require the extra expense of gas, oil, or spark plugs. Just plug it in to charge it up and you’re ready for grass cutting. Just realize that the battery isn’t designed to be removed for charging—so you’ll need to plug in the mower itself to replenish its power. The only head-scratcher is that the best battery life is maintained when the battery is stored in a climate-controlled environment, which isn’t the case for many garages. So realize that the battery may not last as long on this budget mower. Speaking of battery life, you’ll need to be fast or have a small yard—since the run time is about 25 minutes, per the experience of users. However, the specific cutting conditions can make a difference in how long the battery lasts and some say it lasts longer than the stated run time. You’re looking at a 4-hour recharge time once the battery is depleted. Despite these limitations compared to pricier battery lawn mowers, the Sun Joe is lightweight, easy to start, and features a detachable grass catcher. It’s a great choice if you have a smaller yard or want the perks of a battery lawn mower without spending big bucks. It also has been popular with people that have a lawn service but want to make quick touch-ups in between visits. Trade in 3 pieces of lawn equipment for one battery-powered tool that can mow, trim, and edge with the Black+Decker 12-Inch 20V Cordless 3-in-1 Mower. This multi-tasking tool allows you to seamlessly switch between mowing, edging, and trimming for a tidy yard in no time. This battery lawn mower is repeatedly described as easier to use than a vacuum and it's surprisingly lightweight for having so much functionality. This is probably due in part to the fact that there is no blade assembly underneath the unit. Instead, it relies on the nylon string used for trimming to whack the top off grass blades. 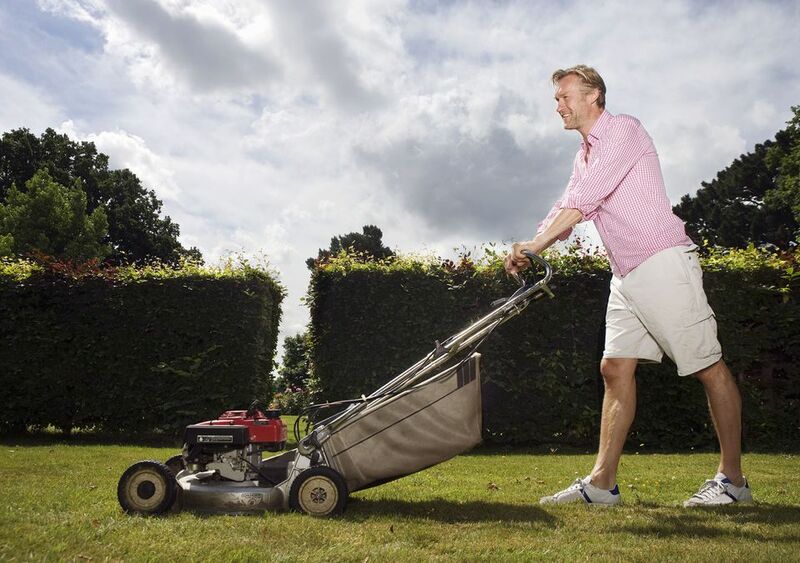 Despite the fact that it has no blade, most people are happy with the mower’s capabilities and just occasionally have to double back to achieve consistent lawn height. The real-world battery life of this model varies but isn’t incredibly long-lasting for a tool you want to use for three different functions. Some people report only getting about 20 minutes on a single charge—but the mower arrives with two batteries to double your run time. If you want to make quick edging or trimming touch-ups as you mow, this battery lawn mower might be a good choice—especially since it will free up storage space. It also uses the same lithium-ion batteries common in other Black+Decker products, so you can always swap out a depleted battery if you have an extra available. Our writers spent 4 hours researching the most popular battery lawn mowers on the market. Before making their final recommendations, they considered 16 different lawn mowers overall, screened options from 14 different brands and manufacturers and read over 125 user reviews (both positive and negative). All of this research adds up to recommendations you can trust.